Across the Internet, the number and quality of gorgeous images grows daily. Well, apropos of this, a little something new is available here at Gizmodo. Ok, it's a big something. It's called HD View, it's in beta, and it's pretty spectacular. And it's yours for the previewing—only if you are using Windows Internet Explorer. In HD view, you'll enjoy all Gizmodo images as they are meant to be enjoyed: as large and crisp as possible. The HD layout responds dynamically based on browser size. And if you can peel your eyes away from the breathtaking image accompanying the story you are reading, glance to the right and you'll see a continuous, scrollable, infinite flow of full Gizmodo stories. 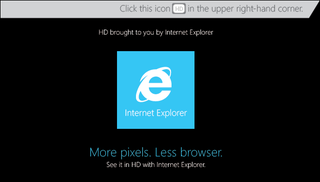 If you don't already have Windows Internet Explorer, go get it. Open Gizmodo, then click the HD view icon sitting to the right of the eyeball and magnifying glass on the top right (see image above), and you'll be looking at Gizmodo in all its HD glory. Enjoy the preview—and don't forget that with Windows Internet Explorer, you can pin Gizmodo to your taskbar and have it just one click away. It's super easy, and gives you a jump on what's new on the site.